Will someone please put Sarah Palin out of her agony? 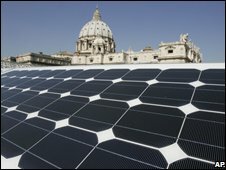 Pope Benedict XVI has become the first pontiff to harness solar power to provide energy for the Vatican. Roof tiles on the Paul VI auditorium – used in poor weather for the Pope’s weekly audience with pilgrims – are being replaced by 2,700 solar panels. The photovoltaic cells will convert sunlight into electricity, generating enough power to light, heat or cool the 6,000 seat hall, engineers say. Conserving global resources has been a priority for the German-born Pope. Since he was elected in 2005, Benedict XVI has criticised “the unbalanced use of energy” in the world. He has also said environmental damage was making “the lives of poor people on earth especially unbearable”. Working beneath a brilliantly clear Roman sky on Monday, a group of engineers in yellow T-shirts positioned the dark cells on the auditorium’s roof.